A type of fish found off the southeastern coast of Australia isn’t much of a swimmer. Instead, it prefers to crawl along the ocean floor on fins that look a lot like hands. But its walking may be limited. It’s critically endangered, with populations dwindling in a hurry. There are 14 species of handfish, although one of those hasn’t been seen in more than a decade. They live in rocky, sandy regions, generally at depths of a few dozen feet. They’re found mainly around the island of Tasmania. The handfish is best known for its “hands.” They’re actually fins. But they extend away from the body on long “arms,” and they’re tipped by appendages that look like fingers. The handfish uses these fins to crawl along the bottom in search of food or mates. Handfish used to be common. By the 1980s, though, they were starting to disappear. Today, the populations are quite low. A survey in 2016, for example, found only about 90 spotted handfish. And the number of known red handfish was down to no more than 40 until a new group was discovered in 2017, perhaps doubling the population. The fish is protected by Australian law. Even so, it’s endangered by many human activities, including commercial fishing, habitat change, and poaching for the aquarium trade. Researchers have started a captive breeding program for the spotted handfish, but it’s too early to tell how effective it will be. 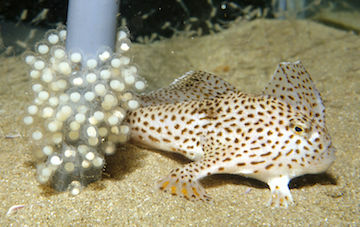 It’s certain, though, that the handfish will need a big helping hand to keep crawling through Australian waters.